I already have a LIMS for my Bionanalytical Lab. So, why do I need IDBS? The quality of your Bioanalytical process will determine the quality of your study and with the right solution, the entire process can flow with seamless, and comparatively worry-free, assurance. As the primary impact on your study timeline occurs during the audit and review phase, isn’t it best to pick a solution that makes this simple, transparent and quick? 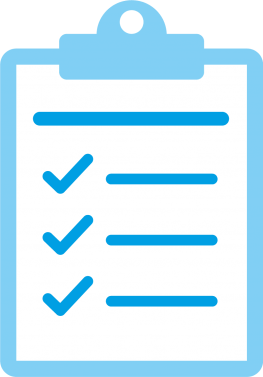 The IDBS E-WorkBook Cloud for Bioanalysis makes it easy to keep track of equipment (daily checks, calibrations, and maintenance), consumables (reagents, stocks, stocks sample preparations etc.) and the execution of the method. Not all platforms are created equal. Your existing LIMS leaves a lot of gaps that need paper-based processes. Let’s take a look. Prevent the use of material not on a ‘critical reagents’ list or from using an unverified balance? Identify the deviations encountered during sample preparation? Eliminate paper across the entire laboratory? Provide you with a modern, intuitive and web-enabled interface? 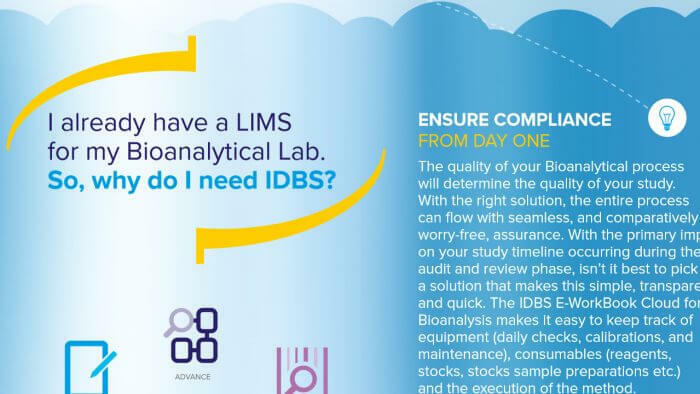 It’s unlikely you could answer yes to all of these questions with your existing LIMS – but with the IDBS E-WorkBook Cloud, you can, because it combines the best of a LIMS, LES and ELN into one platform. We can help you manage your operations, and reduce your backlogs, without having to deploy yet another standalone system. The IDBS E-WorkBook Cloud for Bioanalysis is a complete suite of interconnected workflows that supports small and large molecule bioanalysis. With our bioanalysis solution, you can create and manage electronic methods to drive all aspects of sample analysis, including sample preparation, instrument set-up and post-run QC. The E-WorkBook Cloud can consolidate run data from LIMS and facilitate the compilation of study reports. 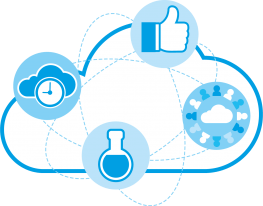 While E-WorkBook can be hosted on your servers, we can also host the solution in a controlled, secure, fully validated GxP Cloud, reducing your start-up costs, and giving you time to get back to what you do best: science. Want to know more about Bioanalysis solutions work in the lab? Wtach this webinar. Or you can get in touch with one of our experts.